Divers exploring coastal shipwrecks in the southern waters of the United States and the Caribbean often find recognizable features obscured by a heavy encrustation of hard corals. These tiny animals slowly cover the hull and appointments of a sunken ship with their limestone secretions, transforming man's trash into a lush tropical reef. While there is no shortage of shipwrecks along the northeast Atlantic coast, the waters are much too cold to support the colorful hard corals found so abundantly to the south. The lack of calcareous corals does not leave shipwrecks wanting for marine camouflage, however, for the task of transforming a sunken ship into a living reef is just as easily accomplished by the coralÕs northern cousin, the flowery sea anemone. A wooden helm wheel in the "mudhole" outside NY Harbor. 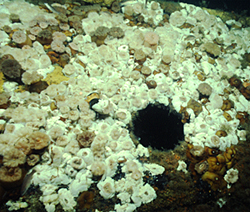 Note how the white and red anemones have organized themselves into groups. The cold waters along the northeast coast abound in water-born nutrients capable of sustaining a rich fauna of marine life. Tankers and freighters sunk in two world wars, along with an assortment of passenger vessels, old world sailing ships and even submarines destined to remain submerged forever provide fantastic artificial reef sites. The twisted and broken hulls of these wrecks are often carpeted with colonies of cold-water sea anemones. 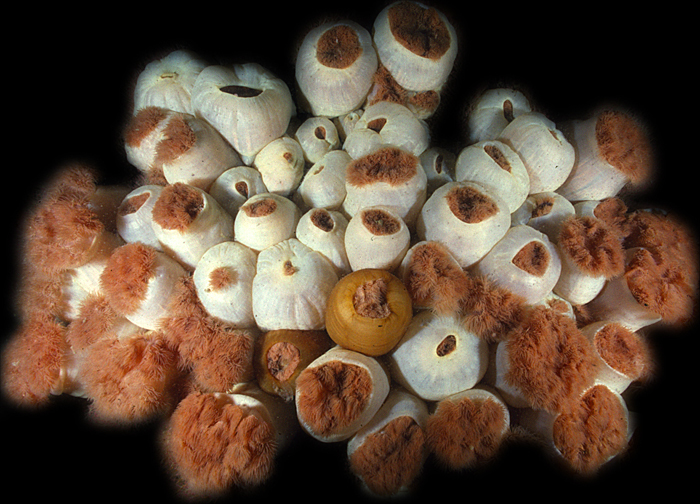 Often packed so tightly together that it is difficult to catch a glimpse of the ship's hull, these anemones appear to compete fiercely for every square inch of available habitat space. The sea anemone is, contrary to its flowery appearance, an animal, and is perfectly capable of providing its own locomotion by crawling slowly along the ocean floor, or whatever other firm surface it chooses to inhabit. Once an anemone finds a suitable home it is unlikely to move on, preferring to remain rooted in its chosen place. Its colorful, flower-like tentacles are intended as a seductive lure to fellow inhabitants and potential food. Equipped with tiny stinging cells used to paralyze prey and capture microscopic nutrients, the tentacles surround and feed the animals mouth with captured prey,. 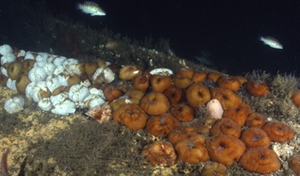 Generally preferring nocturnal feeding, the anemone often remains tightly closed during daylight hours, tentacles retracted into its body and taking on the appearance of a plump, ripe fruit awaiting picking. But these animals are often fooled by the dimly lit, turbid waters along the northeast coast, and can often be observed open and feeding voraciously during daylight hours in the shadowy environment of the shipwrecks they love to inhabit. One of the most fascinating aspects of the northern sea anemone is the variety of colors it comes in, and what could be called its "schooling habits." The color varies widely, ranging from pristine white to pink, green or a deep, reddish brown. The tentacles and body may be of the same or different colors in the same animal. What I find particularly interesting is their habit of congregating into groups composed of animals of like color. Swimming along the hull of a long submerged shipwreck, a diver passes over huge patches of first one color and then another. 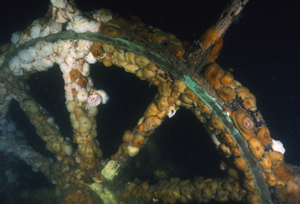 Often a particular object, such as a steam valve or the top of the ship's engine, will be populated with white or pink anemones, while the surrounding wreckage is covered with reddish or brown animals. At other locations, a few small groupings of white anemones can be found amidst a vast field of reddish animals, almost as if intentionally placed to add a splotch of color to an otherwise monotonous landscape. As if cued by some mysterious undersea decorator, these colorful creatures bring to an otherwise rusting hulk the velvety appearance of a living patchwork quilt. Their soft, pastel-like colors dress up the northern coastal ocean in tones more subdued than their flashy Caribbean cousins, but no less beautiful to the discerning eye.